While all Daessy Mounts are fully compatible with iPads and other tablet devices, the mounts listed in this category are recommended if you are looking to purchase a mount specifically for an iPad or similar smaller tablet without the need to also hold larger devices. Articulating Lite Mount: Lightweight and adjustable, the most popular choice for iPad Mini. Not suitable for the large 12.9" iPad Pro. Indexing Lite Mount: Lightweight and adjustable with higher weight limit than the Articulating version. 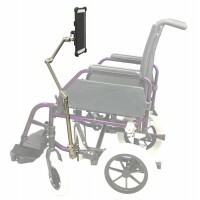 M-Series Side Folding Mount: Favoured for the compact profile when folded, ideal for frequent transport. LM-C: This 3-Length LiteMount combines an Indexing clamp as the first joint for extra strength an..
LM2-A: 2-Length LiteMount with adjustable ball joints designed to hold lightweight devices. The b..
LM-A: 3-Length LiteMount with adjustable ball joints designed to hold lightweight devices. The ba..
LM-I: 3-Length LiteMount with 2 indexed (hirth-coupling) adjustable joints and Articulating Quick..
LM2-I: 2-Length LiteMount with 1 indexed (hirth-coupling) adjustable joints and Articulating Quic..
M75-FM: A lightweight version of the highly popular standard series Locking Side Folding Mount. T..
M75-AM: A highly adjustable mount with adjustable joints and height adjustment, based on the larg..
B/M75-FM: This new version of the M75-FM features black tubes for a discreet all-black appearance..